My parents came out to visit for Thanksgiving and stayed for a whole week! We had such a fabulous time that the week seemed more like a few days. We're heading to Ohio at the end of December to see them again. I can't tell you how great it is to live close to home again! I really missed my family. This will be a gleefully uneventful post, but I thought I should at least inform everyone of our whereabouts during Frankenstorm. On Friday the landfall predictions were further south, which had the eye passing near our tiny town after obliterating Dover, DE. We happen to be surrounded by water. 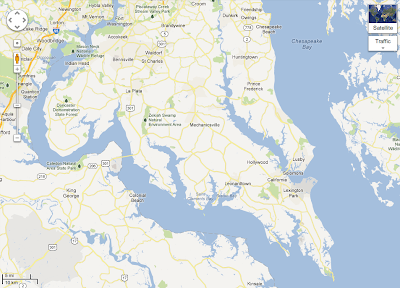 The Patuxent River on one side, Chesapeake Bay on the other, plenty of swamps and creeks in between. Not a good prospect. After I got back from Ohio I was feeling exceptionally motivated. I took it upon myself to extend the backyard fence to include more of the woods (and the clubhouse). The dogs were thrilled! They use the clubhouse as a dog house now and the boys think that's the coolest thing ever. I also insisted we finally hang the gate on it so we can get in and out, now that the kids have places to play with the dogs. Finally, we bought paint we've been holding off on since we moved in to turn our house into more of a home. The light green dining room is not a dark slate gray, and the photos I finally hung up really pop on those dark walls. Autumn makes me ridiculously happy and productive. It also makes me miss my family in Ohio. So, since Noah had Friday off we drove the six hours up for an impromptu visit! Grandma H was especially pleased to see us. The drive there was perfect. We left at 5:30am and the night prior was a little rainy so we were treated to a sunrise through fog onto beautiful autumn trees. I was dying to take pictures of it, but you'd have to make it real life wallpaper to really capture how gorgeous it was. Still, I snapped a couple. Don't worry, I take so many pictures I didn't even have to take my eyes off the road or my hands off the wheel. I love my kids more than taking pictures so I wouldn't have put us in danger. And look... can you blame me?! The boys only require one stop along the way and I try to pick places they can run. We had ourselves a little picnic lunch and a game of tag before getting back on the road. Little Moments, a set on Flickr. I'm thinking of turning these into a huge collage table/wall art... to be decided later.